- Wifi will not work, consider replacing by a BCM43225HMB (Bluetooth + Wifi) or AR9280 (Wifi only). - Sound is not good, share us if you find any working AppleHDA. 2. 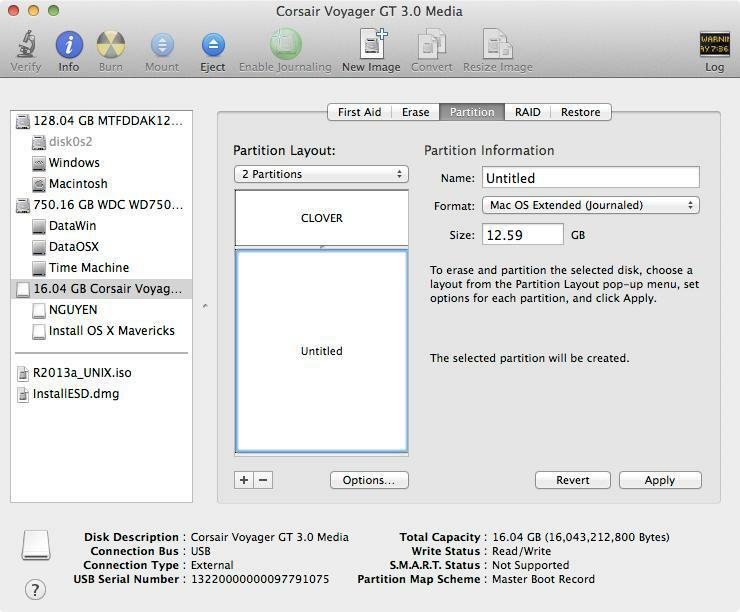 Download Clover.zip, extract then copy EFI folder to CLOVER partition. - Download Mavericks Install app from AppStore. - Your Mavericks Installer partition will be renamed "Install OS X Mavericks"
- Right click to Yosemite Install app > Show Package Contents > Contents > Shared Support, open InstallESD.dmg. 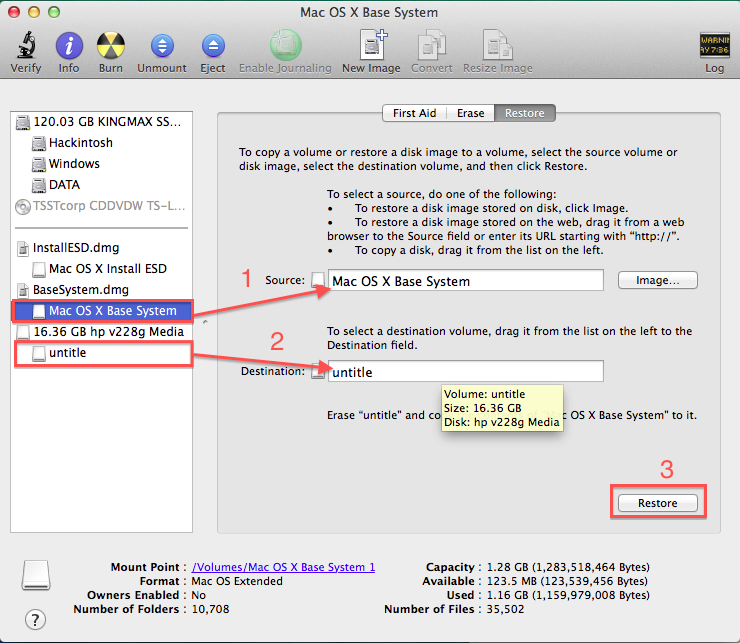 - Use Disk Utility to clone OS X Base System to MacUSB partition. - Add boot option: Add EFI\Boot\Bootx64.efi in USB, then move the boot entry to top. 5. Clover bootloader screen will show up (if not, add Clover in USB in BIOS again), select "Boot OS X Install from xxxxxxxx" (your OS X Installer partition). 7. Restart and Clover bootloader screen (from USB) shows up, select "Boot OS X Install from Install OS X Mavericks" (your Mavericks Installer partition, not your install target partition). 8. Install screen will appear and continue installation. This time, installer will install files to your target partition and create Recovery HD partition. This will end PHASE 2. 9. Restart, Clover bootloader screen shows up, press F4 (this will dump your dsdt, ssdt) then select "Boot OS X from YourPartition". 10. If everything goes well, you can boot straight to OS X desktop. - Tools > Kext Wizard. - Tools > Clover Configurator. If you have errors after running the above command, delete the last file that shows up in error and run again. Don't worry, not all ssdt are necessary. The decompiled *.dsl files will be created in DSDT folder. Click Compile to check for errors, if no error, you can save the file with File Format: ACPI Machine Language Library, name DSDT.aml to /EFI/Clover/ACPI/patched/ (of HDD EFI partition). Click Compile to check for errors, if no error, you can save the file with File Format: ACPI Machine Language Library, name SSDT-1.aml to /EFI/Clover/ACPI/patched/ (of HDD EFI partition). [/code] Go to step 17. Click Compile to check for errors, if no error, you can save the file with File Format: ACPI Machine Language Library, name SSDT-1.aml to /EFI/Clover/ACPI/patched/ (of HDD EFI partition). Click Compile to check for errors, if no error, you can save the file with File Format: ACPI Machine Language Library, name SSDT-2.aml to /EFI/Clover/ACPI/patched/ (of HDD EFI partition). 18. Recheck if config.plist, dsdt.aml, ssdt.aml, ssdt-1.aml are placed correctly in EFI partition of internal drive. 20. Restart, go to BIOS, add Boot entry of /EFI/Clover/Cloverx64.efi in your EFI partition, move it to the top, save and restart, you should see Clover screen and option to boot to Mavericks. Enjoy! Copy config.plist to /EFI/CLOVER/ folder. Use Kext Wizard to repair permission, rebuild cache then restart. - Go to System Preferences > Network, add your connection again. - Download latest HVT, run and select Clover UEFI, Clover Configurator > finish. - Go to /EFI/Clover/kexts/, create 10.10 folder and copy kexts here https://www.dropbox.com/s/mut20ige5ylgj6o/Kexts%20Dell%20E5x30.zip to 10.10 folder. - Use Clover Configurator to IMPORT /EFI/Clover/config.plist, go to Boot section and select kext-dev-mode=1. Then EXPORT config.plist to /EFI/Clover/. Run the OS X Yosemite installer and follow the guide. - Boot to usb drive, format the new partition to NTFS, install Windows there. - Go to BIOS, move the Clover boot entry to top. The guide is updated for Yosemite, enjoy!